Brad Hunker was born in Edmonton and spent the first twelve years of his life on a farm west of Thorsby where he attended Elementary School and part of Junior High. While in Grade Eight he moved to the Pigeon Lake area and attended Pipestone School and then Pigeon Lake Regional High School until grade ten. Brad finished high school in Sylvan Lake graduating in 1980. In 1987 Brad moved back to the community of Falun where he met and married his wife Lorraine and settled there until 1991. In 1998 Brad and his family moved back to the Falun area and later they moved to a farm in the Millet area where they now reside. explosive starts on the “Ready, Go”! As a young boy Brad enjoyed all sports. Baseball, hockey, track and field, football and gymnastics were some of his favourites. 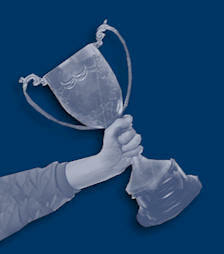 However, Brad’s passion was arm wrestling, a sport he had watched on TV as a youngster. Secretly he aspired to becoming a World Champion Arm Wrestler. In the early 1980’s while working at a Red Deer Tavern, Brad came in contact with some very skilled arm wrestlers. Red Deer was a “hotbed” of champion arm wrestlers; these fellows would frequent the establishment and Brad watched them compete. Some of them showed Brad the intricacies of the sport and Brad entered his first competition in 1983 coming an impressive third to two well known arm wrestlers, the reigning Canadian and Western Canadian Champions. 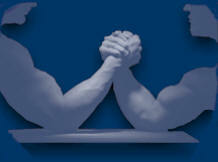 Brad then joined the Red Deer Arm Wrestling Club, one of the top clubs in Canada. Canadian champions who trained there showed him the “tricks of the trade” right from the proper handgrip, proper elbow position to even the small things like where to place your little finger. Later he would travel to the Breton club and train with the pullers there, mastering the “shoulder roll”: and developing his patented explosive starts on the “Ready, Go”! After starting competition in 1983, Brad’s rise to the top level of his sport was meteoric. During a ten year period from 1985-1995, Brad won fourteen Canadian, two Can-Am (1988, 1989) and two World titles (1985, 1990). In over one hundred events in Brad’s career only four times did he not finish in the top three. In a span of four years (1985-89) Brad was undefeated in left arm competitions. He won major titles with his left and right arm in both the Stand-up and Sit Down styles of Arm Wrestling and has competed across Canada, in the United States, Mexico, Russia and South America. In 1991 Brad was a Canadian Champion in two weight classes winning the heavy weight right and left arm championships as well as the super heavy weight left arm championship, an incredible feat. Besides all of his Championships Brad also won three silver and two bronze in World Championships; two silver and one bronze in Canadian Championships as well as four silver in other international meets. 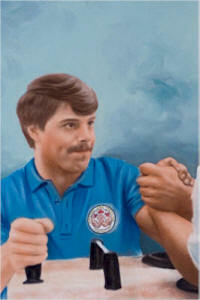 Because of his achievements, Brad was inducted into the Canadian Wrist Wrestling Hall of Fame in 1991. He was also honoured in 1995 by being named Captain of Team Canada in the World Championships in Brazil. 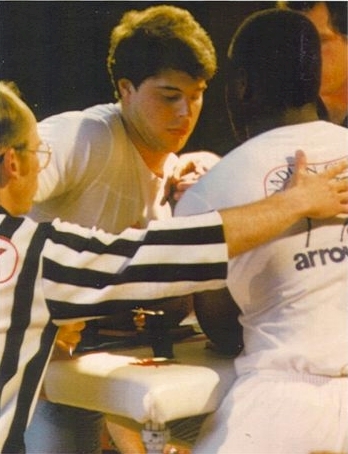 A shoulder injury in 1991 hampered Brad’s training and his ability to compete at the level he desired leading to his early retirement from the sport in 1996 at the tender age of thirty-three (relatively early for arm wrestling). Brad continues to be involved in sports. Brad played on both Slow Pitch and Fastball teams and in 1992 he was the pitcher of a Provincial Championship Softball Team from Drayton Valley. In the past he has volunteered as a coach for minor soccer and as a member of the Brazeau Search and Rescue. Brad has also been called upon to give inspirational speeches to students at Falun School. He now spends hours with his four boys at the hockey rink where he has volunteered as a coach, manager and executive member of both Wetaskiwin and Millet Minor Hockey Associations. Brad has also been the head coach of a “AAA” summer hockey team. Brad Hunker’s incredible successes in his sport of Arm Wrestling and his contributions to the community certainly warrant his induction into the Wetaskiwin Sports Hall of Fame.